You don’t have to be a pioneer woman to enjoy this, call me crazy, but I really do think this is the perfect gift for so many occasions when you can’t figure out what to get someone. 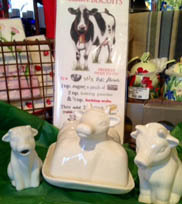 A perfectly white porcelain cow creamer or butter dish, it doesn’t get any more whimsical, kitschy, fun, sweet, or shiny than that. If you think the old butter dish is out dated, or when there is silver foil stuck to your toast? A butter dish is the answer. In any case, give one for the next wedding shower, birthday party, or housewarming gift! Then wrap it in special tissue and put it in a box with a pretty bow. It’ll look like a sweet little treasure. I love these plates and until you pick them up you will think they are made of china or porcelain. These durable plastic plates are perfect for adding class to a camping adventure, taking to the cabin or giving as a hostess gift. 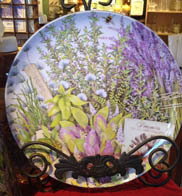 The very pretty lavender pattern is infused right into the plastic surface so it will not fade or come off. So nice they can be used all summer long and you will get plenty of complements. 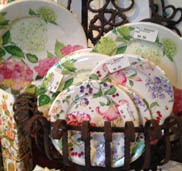 Welcome spring or summer in style with a pretty place setting at your table! Pretty paper plates can really make your table stand out. These high quality, stylish paper plates will hold up to any breakfast, brunch, lunch or dinner fare, are food safe and recyclable. With a lunch and dinner size to choose from, you will be able to impress your friends no matter what the occasion. 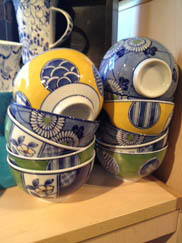 How very adorable are these bowls? Any kitchen can use small bowls. These porcelain bowls are food, microwave and dishwasher safe, with a thousand uses. They will make a wonderful breakfast bowl from grapefruit to cereal. Your kitchen does not have to be “shabby Chic” to have these stand out on your shelf. Small enough they can be packed to a potluck and admired, but large enough that all the leftovers fit in for tomorrow’s lunch.